Located in Maroubra, Kura is a relatively new Japanese restaurant. The food is absolutely delightful. 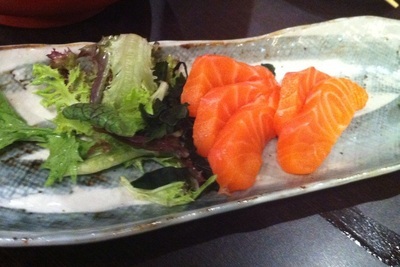 Depicted below is their fresh salmon sashimi, tender and lovely. I highly recommend going to Kura. I'm an avid lover and promoter of salmon. If you do end up trying it out, I highly recommend trying the aburi salmon as well. Although it's not pictured in this article, that's because I ate it so fast, that there was none left by the time I went to photograph it. I don't usually like battered vegetables that are deep fried only to be dipped in some sort of liquidy soy-looking sauce. At least, that's how I usually see tempura; I like to move straight to my sashimi and avoid anything else. Luckily I was feeling adventurous so I tried the vegetable tempura at Kura. I had half of the portion but wished I could have eaten the whole thing. There are two of everything - two pieces of sweet potato, zucchini, eggplant and mushroom. Mushrooms are my favourite vegetable but I had trouble deciding which of the Kura tempura vegetables were my favourite. I highly recommend this dish, even if you don't usually like tempura like me. I don't like takoyaki very much as I feel sorry for octopus and think it's adorable, but one of my best friends doesn't share my sentiment. He says that Kura takoyaki is the best of many eastern suburbs' Japanese restaurants. So there you have it folks, if you want to eat delicious takoyaki, try it here. These absolutely delightful croquettes are served as an entree at Kura Japanese Restaurant in Maroubra. As with everything that Kura does, great care and quality was obviously taken with the preparation of this dish. These croquettes were unique, with a surprising combination of ingredients. As an avid potato lover at first I was disappointed at an evident lack of potato, however as I continued to eat my croquette I was pleasantly surprised by how delicious a pumpkin croquette can be. Tender, soft and warm, these croquettes were also a bit larger than their counterparts at other Japanese restaurants. Overall, I must say that Kura has excellent service, value for money and I must emphasise this - delicious food. This is the newest of the Kura restaurants - there are ones in the city including Haymarket and Pyrmont. I consider Maroubra to be very lucky for having this gem. Why? Beautiful Japanese in the Eastern Suburbs.